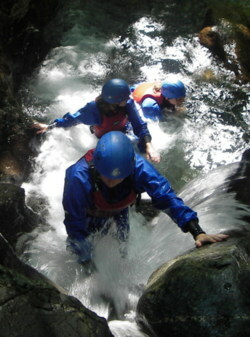 Adventure21 - Gorge scrambling risk assessmentRisk assessment in the Lake District, Manchester and Lancashire uk. Hazards arising from risk � slipping, tripping, falling and submersion in deep cold water. Risk management � qualified experienced person/instructor to lead the session. Adequate clothing and safety equipment to be worn during session. Risk involved � walking and scrambling over loose slippery rocks. Scrambling and in some places climbing up, over and under large rocks and waterfalls. Wading and swimming through water. Hazards arising from risk � slipping, tripping, falling, possibility of being washed down stream and submersion in deep cold water. Effects of hazard � cuts, bruising and in extreme cases broken bones. Possibility of hypothermia and in extreme cases drowning. Risk management � qualified experienced person/instructor to lead session. Adequate clothing and safety equipment to be worn during session.